Release Info for Megahouse's ActiBuilder SSSS.Gridman figure is finally out. The figure will be coming out in March, there'll be an option to buy him with the vehicles for 16,800 yen or on his own for 5250..which might sound pricy considering that he'll only stand at about 10 cms tall. Those look cool but that price. Ouch. lol. 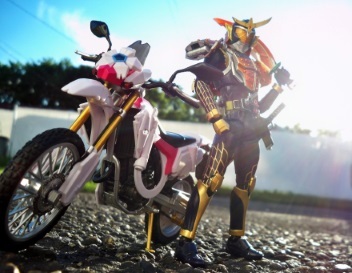 Wondering if Bandai will make any SHF/Ultra-Act figures for this show. Excellent detailing, but definitely ouch on that cost. Yeah. Though there is the possibility of Bandai getting the rights to it if it's included in another program or movie special and can be under that banner instead of the anime one. Depends on how merchandise rights work in Japan, and if it's on direct show, or likeness rights to the character as a whole. But the anime toy rights are under a different company, which is probably for the best right now anyway due to how much other material Bandai of Japan already produces. While they do great work, we also don't really want a full tokusatsu monopoly under them either. So helping some other companies out isn't a bad thing. And like I said, depending on how the rights are divided, if the live suit gets used in a future Ultraman crossover thing, or even an R/B special, or otherwise, it may let bandai have some character access through that. Technically speaking, the anime rights and live rights might be two different rights entities, so long as the titling on the packaging isn't the same. Ah, did not know that. Well, these do look like nice offerings if only the pricey side for their size. Would probably wait for reviews before buying any. At 10cm tall, that makes it roughly 3.9 inches tall. About the size of a modern era GI Joe or little taller than a Shodo figure. Which is cool, but damn I don't know if that's 50USD +shipping kind of cool. Though still cheaper than many of the Fate figures in the same size. 168 USD for the with vehicles seems really steep too. Do we know how these are constructed? Because if we're talking nearly solid metal, I might be able to see why it costs so much. Do want though, so may end up biting eventually. I do like that size class. Yeah, if this was somewhere in between 50~55$ USD including assist weapons I would not mind it but yeah... I would rather use the money to buy lots of groceries or 2 figuarts and a nice meal. Looks beautiful, but 168 bucks can get me a whole lot of other things. Last edited by Sunred; 09-13-2018 at 08:29 AM.. Guess I'm going for Good Smile's Gridman. This one is just too small for me.